When shes not furthering the mission of her organization Spare Parts (which collects and distributes a wide range of supplies to arts educators across San Antonio), reuse specialist Mary Elizabeth Cantú is a quite likely crafting something unique from materials shes fished out of a recycling bin. Not only has she been making covetable Valentines Day cards since the 1990s, Cantú is a proud graduate of Mount Holyoke Collegethe revered institution that produced 19th-century greeting card innovator Esther Howland, whos counted among the earliest entrepreneurs to harness Cupid for commercial purposes. Rising to the cheesiest of all occasions, Cantú and crafty collaborators Eric Cavazos and Giovanna Carrola offered Current readers an array of DIY ways to woo your sweetheart with quirky keepsakes made from upcycled Altoids tins, Post-it notes, sporks, corks and red Solo Cups. Cavazos' cardboard creation made use of buttons, a plastic spoon and a red Solo Cup. A queso fanatic, Cantú fashioned this offering from used Post-it notes. This "Love Bug" is made from a cork, rickrack, felt and googly eyes. 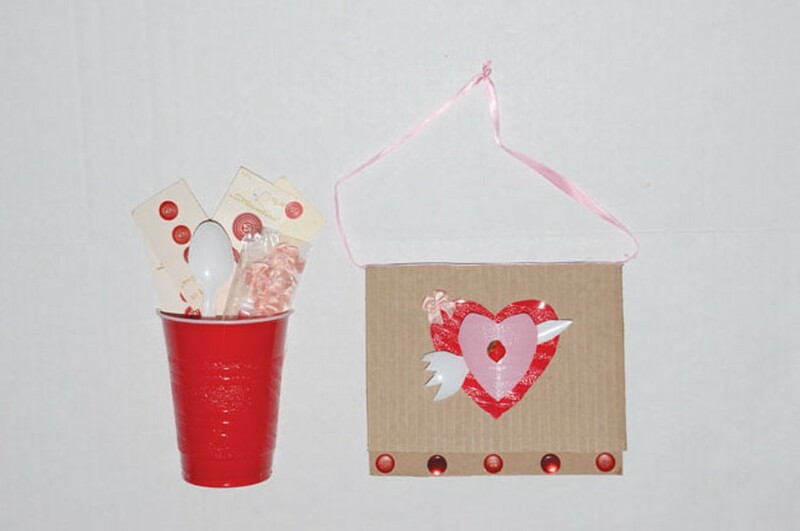 Carrola filled Altoids tins with paper hearts and a poem penned by her daughter.